Tract housing, also known colloquially in the United States and Canada as cookie-cutter housing, is a type of housing development in which multiple similar homes are built on a tract of land that is subdivided into individual small lots. Tract housing developments are found in world suburb developments that were modeled on the "Levittown" concept and sometimes encompass large areas of dozens of square miles. Tract housing development makes use of few architectural designs, and labor costs are reduced because workers need to learn the skills and movements of constructing only those designs rather than repeat the learning curve. In addition, as all homes in the development will be built at the same time, the cost of purchasing and transporting building supplies may be reduced due to economies of scale. Components such as roof trusses, plumbing, trees, and stair systems are often prefabricated in factories and installed on-site. This allows builders to offer lower prices, which in turn can make homes affordable to a larger percentage of the population. Early tract homes were often identical, but many tracts since the late 20th century have several designs and other variations in footprint, roof form, and materials, along with options such as garage bays, for a more diverse appearance. 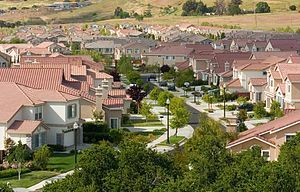 The concept of tract housing is occasionally mocked in North American popular culture as the basis of suburbia; notable examples are the songs "Little Boxes" by Malvina Reynolds, "Suburbia" by the Pet Shop Boys and "Subdivisions" by Rush. It is also often critiqued by city planners and architects, as its construction tends to overlook required elements of successful community building, instead creating a homogeneous residential neighborhood with no local employment, commerce, services, or attractions within close commuting distance. This leads to a heavy reliance on automobile travel, as residents are unable to address any of these needs locally. In Europe, the majority of subdivided landstrips are built in the type of row housing development areas. The model of tract housing had been used widely in the history of land reclamation in the 17th to 19th century, especially in the Netherlands and inner-European (former) bogs. Modern tract housing had been used for company towns in the 19th to 20th century, especially in the areas of coal mining that attracted a large number of workers. A tract housing area of this type is colloquially known in German as a "(Zechen-) Kolonie", and in Flemish Dutch and French as a "cité"(nl)/(fr) or "coron"(fr). ^ "Why do cookie-cutter neighborhoods exist?". HowStuffWorks. 2012-05-02. Retrieved 2017-03-23. ^ "15 Milestones That Changed Housing". 2002-03-13. Retrieved 2017-03-23. ^ "Why commuting costs can make the 'burbs more expensive than living downtown". Retrieved 10 April 2018 – via The Globe and Mail. 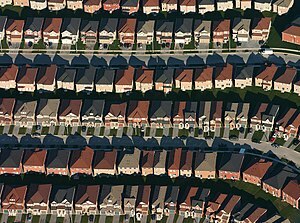 Wikimedia Commons has media related to Tract housing.